Spoiler alert: some of these facts contain important plot points! Crows or ravens have been observed attacking a small coyote pup. In the first chapter, crows attack Scruff. This part of the story was inspired from a phone call I received in 2016, when I was working on the Vancouver coyote hotline. The woman said there was a tiny coyote pup all alone on her front lawn. She watched as crows (or it could have been ravens) started to dive bomb and attack it. As it yelped and cried, she tried to decide whether to save it or not. The idea of whether we, as co-existing neighbours, should ‘rescue’ coyote pups, can be a bit tricky. In most cases, a pup is alone either because its parents left it for a short time to go hunting, or because it’s so weak that it doesn’t stand a good chance of survival. In neither of these cases is rescuing the pup a good option. In the first case, the parents will be very upset when they get back and their pup is ‘kidnapped’. In the second, it is a weak individual, and this is nature’s way of weeding out weaker coyotes and maintaining a strong general population. While rehabilitation centers are good in certain situations, they aren’t a good option for every abandoned pup. 2. Coyotes can be extremely playful and will do things like roll a ball down a hill and then chase after it. : Early on in my writing of the book, my mother sent me this Youtube link. I watched in on repeat, surprised to see how playful the coyote was. It reminded me of how my own dog plays with a ball. This activity wove itself into the very next chapter! 3. Eye injuries are common and potentially very serious. In Chapter 4, Pica’s eye injury, which was just a scratch, gets infected. Having short-term eye problems is not uncommon for wild coyotes, but an infection leading to permanent blindness is likely quite rare. 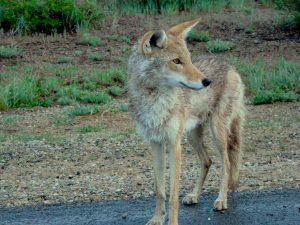 We don’t track urban coyotes with enough detail to know this, but Janet Kessler has recorded some of the more minor injuries on her blog. Leg injuries are also common, and this type of injury occurs in Street Shadows as well. 4. Coyotes cross a lot of roads – and it’s the most dangerous thing they do! National Geographic created Crittercam – a special coyote collar with a camera and tracking abilities. Although there is debate about whether it’s a good idea to put collars and cameras on coyotes for research, they do allow us rare ‘first-hand’ footage of what life is like through their eyes. You can see one of the videos here. 5. A coyote really did fall into a construction pit. In Chapter 11, Lamar falls into a pit at a construction site. When I visited the Wildlife Rescue Association of BC to see their coyote rehabilitation enclosures, a staff member there told me that earlier that year, they had rehabilitated a coyote that had fallen into one of these pits. 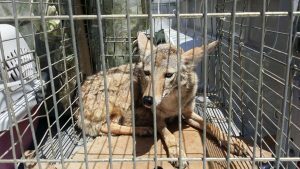 They had received a call one morning from a construction crew who said that the coyote, while still alive, was unable to get out. They were able to rehabilitate it successfully. 6. 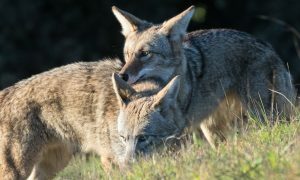 Coyotes help each other when they are injured. In chapter 13, Pica has a leg injury. Her family sticks close to her, moving at her pace and bringing her food. This type of altruistic behaviour was observed recently by Janet Kessler in San Francisco here in her blog. 7. Coyotes strongly prefer eating rodents and plants to human garbage. In chapter 14, Scruff is forced to eat more garbage, being young and on his own for the first time. This is provoked by his desperate situation, being abandoned before he is fully capable of hunting and looking after himself. 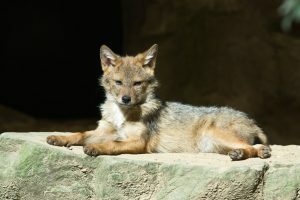 Many researchers, including Stan Gehrt (2007) and Lukasik and Alexander (2012) have pointed out that human sources of food typically only make up about 5-15% of coyote diets. 8. Coyotes can make their homes in really noisy places. In chapter 14, Scruff finds himself bedding down under an elevated train that runs most of the night. I knew of a coyote habitat in Vancouver, B.C., where a coyote lived in this exact type of location. Each time a skytrain passed over his home, the train wheels would screech loudly. It may not have been peaceful, but one of the strengths of the species is that coyotes are very flexible when it comes to finding a place to call home. 9. The description of Pica’s capture is inspired by actual techniques used by wildlife experts. When Pica is discovered at the school, unable to move, Alyssa and Doug capture her carefully using a Y Pole and kennel so they can bring her to the rehabilitation center. Capturing coyotes is only a good idea in very specific situations and by experts, so I’ve never been involved with one, but I wanted the scene to be as realistic as possible. 10. 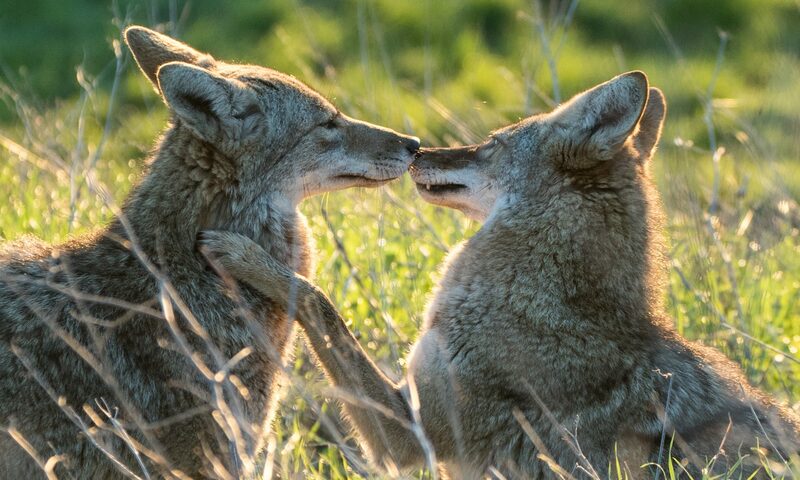 Coyotes have been known to kill pups living on adjacent territory. Although this type of behaviour is rare and not well documented, in 1978 F. J. Camenzind published a paper detailing this behaviour. It was not in an urban context – he was studying coyotes in the National Elk Refuge in Jackson, Wyoming, but it is not beyond the realm of possibility that something like what was revealed in chapter twenty-four could happen.